Don’t become complacent, because the place you’ve been sent is not your final destination. It’s a place of preparation before positioning you in that place for the upcoming outpouring of My Spirit. Don’t detest the hardships you are facing; because you will make it through them. Do not be discouraged, and don’t think you are starting over. You’re not starting over, you are maturing and gaining much‐needed wisdom for the battle that lies ahead. And don’t fear the battle, because the battle belongs to Me. If you keep your feet upon the path I’ve ordained, victory is assured. If you begin to feel weak, or your hope starts to fade away, simply exercise your faith in My word and be renewed. I want you to remind yourself of Who I am. I am your loving Father and I am committed to taking care of you. I want you to choose to believe in My goodness instead of listening to the lies of the enemy. 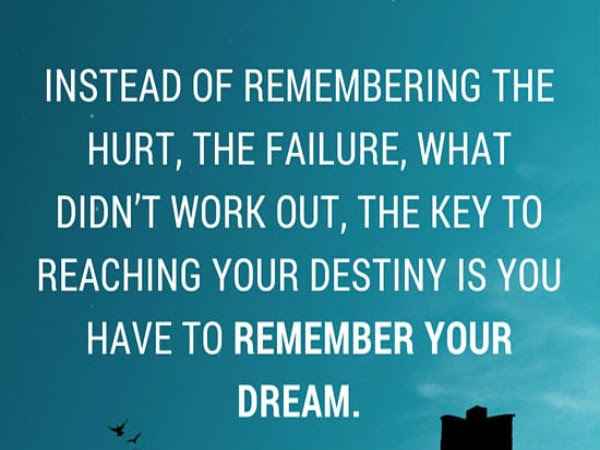 I am here to restore you; remind you of your destiny and set you back on the right path. Believe that I am good and choose to stand in faith holding onto My word. I have brought you this far, I will not leave you. There are greater things yet to come. I am a God of restoration, and I want you to remember your destiny. Now, believe and trust in Me and remember your destiny. 2Ch. 20:15 …Thus saith the LORD unto you, Be not afraid nor dismayed by reason of this great multitude; for the battle is not yours, but God’s. Joel 2:25 And I will restore to you the years that the locust hath eaten, the cankerworm, and the caterpillar, and the palmerworm, my great army which I sent among you. Psa. 34:8 O taste and see that the LORD is good: blessed is the man that trusteth in him. Jas. 2:5 Hearken, my beloved brethren, Hath not God chosen the poor of this world rich in faith, and heirs of the kingdom which he hath promised to them that love him?